Home / Jewlicious / Why is this issue being kept under wraps? Why is this issue being kept under wraps? Jewish women? Wearing burqas and abayas/jilbab? In Ramat Beit Shemesh? –Quote from a Burka and Hijab wearing Jewish woman in her late 20s, who lives in Jerusalem. And this woman is not alone. A friend of mine attended an odd wedding and shared some pictures of the new fashions. The one on the left is wearing three head coverings: one under her chin, one covering her forehead, and one going all the way down her back. This is in addition to a full-length cloak….According to the Haaretz article, a woman called Rabbanit (rebbetzin, wife of the rabbi) Keren is behind this approach. She has ten children and leaves the house as infrequently as possible. She also maintains a “taanit dibur,” a speech fast, except for four hours a week when she gives classes and treats women as an alternative therapist. I don’t know how she manages not to speak with her husband and children. She wears ten layers of clothing…and advises women to switch the heels of their shoes so that they won’t click. Makeup and perfume are also taboo. Toward the end of the Haaretz article, the author quotes a professor who suggests that this extreme modesty is similar to anorexia. I agree; it’s obsessive behavior…Or maybe I’m being judgmental? When rabbis in certain circles emphasize women’s modesty above all other virtues, it’s no wonder that some will take things to the extreme. The blog Tikkun Olam echoes my other fear: if this gets adopted by any sizable community or authority — especially in light of the already radicalizing charedi elements in Israel’s strengthening and growing — it will effectively kill Judaism “as a viable choice” for most people. 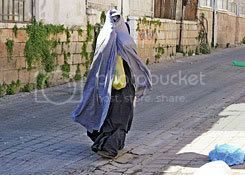 One man, according to the Haaretz article, took his wife to beit din (Rabbinical court) upon her decision to wear a burqa, saying she had done horrible damage to their shalom bayit with her new choice of garb and her refusal to stop wearing it. The court ordered a divorce even though he didn’t request one…because of her bizarre behavior. 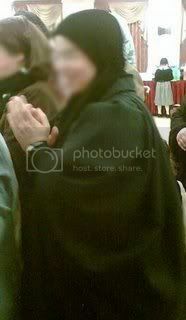 Rebbetzin Keren is doing klal Yisra’el no favors by teaching these women to wear burkas and abayas, on the contrary. Modern Orthodox and less radical charedi Jews in the area have already begun to voice their frustration with the radical elements who insist on beating, burning, and stoning their way into legislating their outlook with “ongoing Orthodox-on-Orthodox violence”. Virtually all American Orthodox Jews would be targets of tznius patrols were this to be considered the new standard for haredim, even if only in Ramat Beit Shemesh Bet, or worse, chas v’shalom, were a Rabbinical authority to rule in favor of the attire. A modern charedi Jew-by-choice since 2000, and igniting headphones with Torah hiphop since 2001. Originally from Maryland and now holding it down in the shtetlach of New York, won the Jewish Music Awards for "Best Hiphop" in 2006.Vocally anti-prejudice and pro-unity. Love me, hate me, or debate me, know you can't ignore me, though. It’s an alarming trend when ‘religious’ extremists try to raise their personal ignorance and issues to the level of dogmas. I once read a great article by an Orthodox rabbi on why it was important for the torah to elaborate on the physical beauty of the matriarchs – they were not pious and wise women because they looked too smurfy to do any better than being pious and wise, but they were astonishing beauties that, despite being able to lead a way easier life as some ‘arm candy’, also were wise and pious. I’m afraid that unless some prominent rabbis put a stop to this rapidly, your hopes are going to be dashed within some short years. Extremism pushes its adherents to further extremism and they feel perfectly comfortable pushing everybody else into their corner. As you wrote, sometimes they will use violence and threats to get their way. What was once some people speaking negatively about women wearing the “wrong” clothes, became closed communities where women were “restricted” by the community, then turned into the occasional attack on women outside the community who did not meet standards, and is now being converted into this burqa craziness. All of this just goes to prove that those of us who are shouted down every time we find any sort of parallel or crossover in anything between fundamentalist Jews and fundamentalist Muslims were clearly imagining it. Bad. Modesty is composed of 1) common sense in attire, and 3) a mental component – a modest mentality, and way a way of acting and talking that contains innocence. If the proper intention is there, all will be fine. If not, no amount of cloth will help. The not-talking part gives away that this Rabbanit is anti-life. Reminds me of when Rabbi Akiva was told by G-d not to burn up the material world with his eyes. We are cautioned severely not to ADD to the law either. Not just to not subtract from it. Worshiping cloth is making an idol. The cloth won’t save you. If men are treating these women disrespectfully, that has to be confronted head-on. This veiling is ducking the problem, by hiding, and will not work. It is cowardice posing as virtue. How well the force of darkness knows how to use people’s desire to be good against them! Oh, I forgot to mention that this burqa movement is an extension of the new segragated buses movement. It’s all part of a larger move to extreme observance. The exact same people who like segregated buses are giving this Rabbanit and her followers a very hard time – constant criticism, even shoving. Good. Post 1 says it all. I see it as one and the same. The point is the increasing frumminess across the board, to a degree where even the best respected MO rabbis in the US now have to bow down to the Israeli rabbinate. THAT right THERE says it all. Why is that a virtue to be upheld? For the sake of modesty, not speaking to your own son? Or your husband? Dear Sarx, post 12: Please note this veiling is being criticized here on its own merits, with no mention of any other group. The silence, or speech-fasting, is not about modesty, it is an attempt to be very pure and unworldly. Unforgiveable in a mother with children at home. This has a false-messiah, cult-like smell, and should be ruled against quickly, before the charismatic Rabbanit ensnares any more women in this Chillul Hashem. That means bringing disgrace to G-d’s reputation. The trust, and respect, between Jewish women and Jewish men, mutually and in both directions, is the foundation of the world. She is acting as if the women have to hide from the men, a grave insult to the men. She has “spit in her father’s face”. Indeed, JM, not talking to her children is a gross neglect of her children’s needs, and it makes one wonder whether she is fit to be a role model when she does not seem too fit for parenting. In Me’ah She’arim, some women aren’t supposed to talk in public. In Ramat Beit Shemesh, apparently some women aren’t supposed to talk. They are raised to believe that to wear 10 layers of clothes and never to leave the house is to be tzaddeket (righteous woman). It’s way beyond sad; it’s cruel. Sometime back in the past (1700s or 1800s if I’m not mistaken), some monarch had a large number of newborns taken into his custody (the original report said they all were orphans, but I’m not too convinced of that) and had nurses look after them to feed them and to clean them. The nurses, however, were strictly forbidden to talk to the children and / or caress them. That monarch wanted to find out if language production abilities are innate and if so, what language children spoke uninfluenced by their environment (he mused it might be their parents’ language, Hebrew as “the oldest language”, or Latin as “the classic language”). All of those children died before they reached the age of language production even though they were technically taken care of. It should be against the law for these women to wear Head coverings or Burkas. How dare they have the right to wear what they want. Shave all their heads and give them wigs. Thats more like it. Truly truly frightening. If I were not living here in Israel, I might find it funny. But I can seriously envision some crackpot (but important) rabbi picking this up and-whammo-the Eshet Chayil will be silent, stuck in her house, and wearing piles of clothes. Incidentally, if the Rabbanit recommends that women leave the house as little as possible, speak as little as possible and, in short, have as little as possible contact with the outside world, how are these ladies supposed to work and support their husbands in kollel? Another point–10 layers of clothing? In the summer? In Israel? Yucko….. Don’t sit next to one of them on the bus. That article is the most gratifying thing I’ve read all day. Mi kaf regel v’ad rosh is from my bar mitzvah haftarah. How fortunate we are to live in an age where an article in an Israeli newspaper begins with Isaiah’s turn of phrase! Wow, talk about Islamic cultural influence! Maybe there’s a silver lining to this cloud, however. If the ultra-orthodox make themselves to appear more and more like the Islamists in their practices, then maybe other Israelis will be so turned off to them that the orthodox in general will lose their out-of-proportion power within Israeli politics. Regarding the commenter from Muqata who said that, â€œ[if] the Rabbanim are pushed by radical women into mandating this, Judaism will be permanently changed.â€ Well, since when have radical women ever succeeded in pushing rabbanim into anything? If someone has an example, please share. I don’t know much about the history of this and am wondering how many times women have managed to exert their influence on the Israeli Rabbanut in such a fashion? The “radical women” push their husbands into mandating this as the “new standard”– and then burqas are commonplace. This rebetzin sounds mentally ill. Unfortunately, the rabbinic leadership has repeatedly demonstrated their total lack of spine when faced with such situations. There is enormous peer pressure among these “sages” to not be caught out – not be seen as more lenient that other prominent rabbis. So they repeatedly fall into the trap of being manipulated by “askanim” – fanatical “community leaders” who often misrepresent the situation to get a Rabbinic signature on a ban. This is what happened with the ban on Rabbi Slifkin’s books about evolution – people who had never read the books condemned them. See here. It’s not a rabbinical “lack of spine”, these types of things, if they are advocated, are eventually seen as “what the people want”, the “decree” that the people can “stand on”, and then it gets legislated. Look at kashrus for Passover for instance. For example, once, I asked a Rosh Kollel in Flatbush once about the whole “no processed food” thing some Hasidim take on during Passover. He responded with a story of a woman who had asked him if she could eat her Seder meal in her dining room. She had forgotten to wash the walls for Passover. “The walls?” the rav asked. “It’s Pesach!” was the reply. “No you don’t have to wash your walls”. Of course she did anyway, and if she had students (b/c as we see above, Rebbetzin Keren is not a rabbi), chances are, she’d tell them to wash their walls too. And once enough women are doing it, it becomes “tradition” or “what the velt does” or “how the velt fiert zich” and then things get codified. Thanks the God our women are starting to follow the halakha of married women wearing a radhidh over their miTpaHath in public. A return to authentic Jewish culture and halakha is finally happening! True servants of the God will give praise. Others will scoff. If this catches on, which I doubt , it would be much easier to bomb Jewish neighborhoods. It would be the end of all security there. The Bet Din ruled against this, with startling force. Imagine, they ordered him to divorce his veiled wife, and he hadn’t even asked for that. Good for the Bet Din. So we DO TOO have some competent authorities. No, Judaism is not a mental illness. It is a major civilisation and the source of much that you see around you. Shabbat Shalom.